I began selling Neals Yard Organic when my children were 3 and 1. I began as a way to meet people and to earn money, what transpired was that these products would awaken the healer within me that was aching for plant medicine, self care, the opportunity to meet like minded women and share the gift of treating your body with fierce love, reverence and kindness. That was 7 years ago. I am more passionate than ever about the quality of these products and the magic of what they can do for you mentally, physically and emotionally. Below are the products I rely on myself - these have become tools I rely on for my entire family wellbeing. I share them with you to help you see how they might support you. The link below will take you to my Neals Yard page - I hope you choose to go there. Frankincense is my go-to essential oil for all things - healing Otis' head injury, focusing in meditation, feeling gorgeous everyday (I wear the essence as a perfume) and the Frankincense Intense range is mind glowingly fabulous for younger looking skin. Yes, the Egyptians did use Frankincense to mummify their leaders, so who can argue with that? It's not cheap, but it's more precious than gold. Man, woman or child, Wild Rose Beauty Balm is the most nourishing cream you could ever with so. Sun burn, chapped skin, just feeling a bit tired? Sleep with Wild Rose Beauty Balm on and wake up feeling 10 years younger. It also works as an excellent exfoliator. Personally, I love the idea that my daughter never, ever, ever uses toxic chemicals as a deodorant. 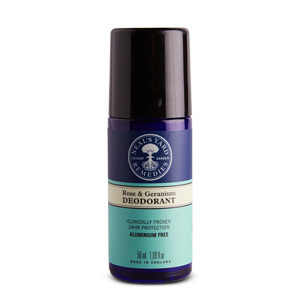 This Rose & Geranium deodorant smells exquisite and works. And the only things entering her blood stream and lymph nodes are essential oils and goodness from plants - yay!